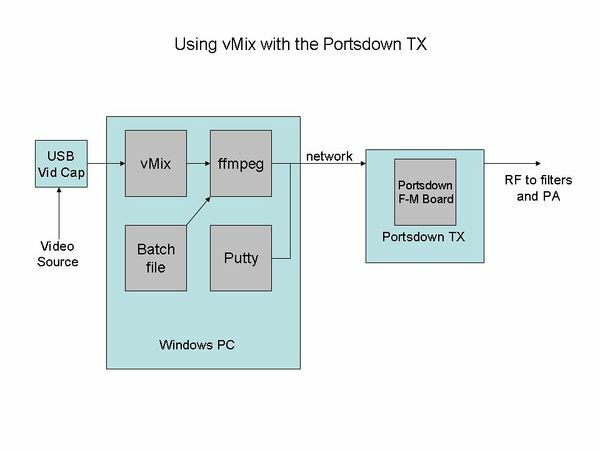 You can stream video from vMix from a Windows PC and then transmit it using the Portsdown transmitter. This works with the either the Portsdown filter-modulator board or DATV Express. 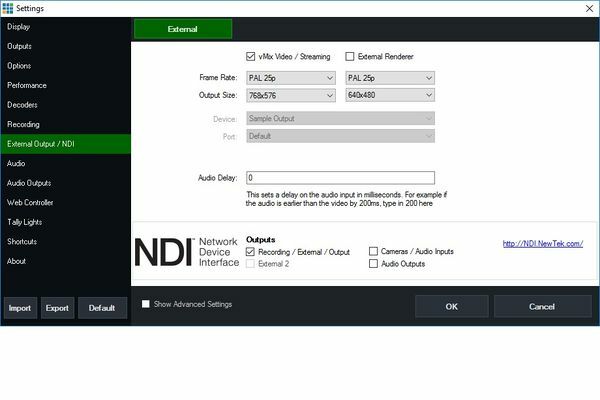 First, install vMix on your PC and make sure that it works with your selected video source. vMix can be downloaded from here: http://www.vmix.com/ The free version handles SD video and is adequate for our needs; it works in this mode after the 60-day trial period. The next step is to install ffmpeg on your PC. Download it from here: https://ffmpeg.zeranoe.com/builds/ Use the release build, 32-bit, static. Unzip the downloaded file and move the files to a folder called ffmpeg on your C:\ drive so that it has the folders bin, docs, licenses and presets inside it. 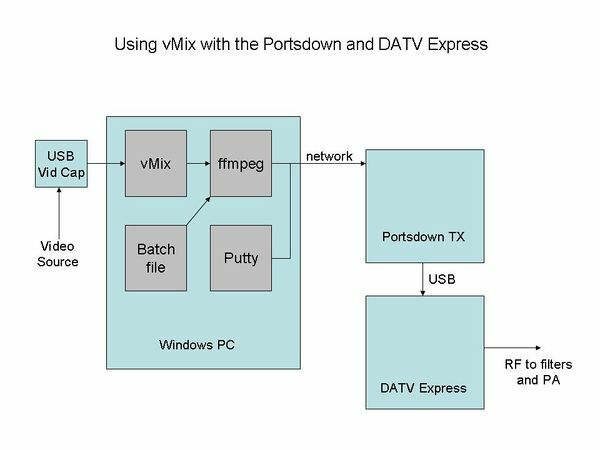 Make sure that your PC with vMix and your Portsdown transmitter are on the same wired network. Wireless networks might work but have not been tested. Click OK on the dialogue box and then click the Output caption. It should turn red. Next, start the batch file that you edited earlier. Double click on the file in Windows Explorer, and it should ask for the Video bitrate and FEC, then ask you to press any key. When you press a key, the window should change to one giving information about the stream being sent towards the Portsdown TX. The stream is simply squirted at the IP address that you entered earlier - it can be left running and the TX does not need to be on. Lastly, set up your Portsdown TX with IPTSIN as the input and identical SR and FEC to that set up in the batch file. Select transmit and it should work. You can select transmit and standby on the Portsdown console (or touchscreen) without having to change any other software settings. This mode does not currently work (6 December 2017), but will be bug-fixed in the next release. Initial set-up to use DATV Express is the same. You can then repeat this test having adjusted the video bit rates in the vMix2Portsdown.bat file. This page was last modified on 19 December 2017, at 13:27.